These are sooo easy and sooo yummy. potatoes ( how ever many you want ) washed. I don't peel them but you could if you wanted to make more work for yourself. Preheaat oven to 200C. Grease ( or use baking paper - that's my preference ) a large baking dish. 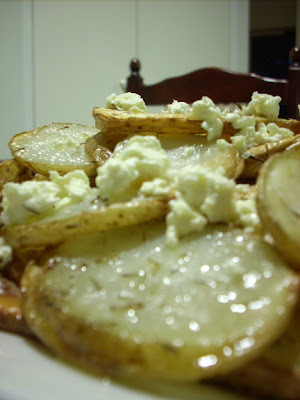 Add crumbled fetta cheese to top and serve. Yesterday, for Sunday lunch, we had roast lamb ( just stuffed fresh rosemary and garlic under slits I made in the skin ) with these potatoes and those lemon carrots. Delicious ! That looks so yummy! I'll have to make this before the frost kills off my thyme in the garden. Try to throw above from the slice and... honey, sure you will be astonished pleasantly. I can testify to the deliciousness of this dish. We had it tonight. Yum! Hmm.. I might try this this week. Also, a tip I learned from food network, but haven't tried yet, if you preheat your greased pan, then put the potatoes on top, it helps them crisp better... it's more like frying, but still less oil. I'm gonna try it, we'll see if it makes any difference.